It's that time of the year! Sephora's Spring Bonus Event aka the Sephora Beauty Insider/VIB Sale is happening! A perk of the Sephora Beauty Insider rewards program, this sale grants members a discount of 10 - 15% off almost everything depending on your level of membership. Many people use these sales to stock up on their favorite beauty essentials and/or splurging on items they've been eyeing for awhile. Gift cards, eGiftcards, FLASH and PLAY! by Sephora, packaging, taxes and shipping are excluded from the promotion as are products from The Ordinary. But almost everything else is eligible including many luxury brands that don't usually go on sale. Online and in-store shoppers are limited to one Dyson product and three Drunk Elephant products per purchase. Don't forget to take a look at the "Sephora Favorites" which are value sets featuring makeup and skin and hair care products from a variety of brands. They're usually a pretty good value and the sale prices are even better. These make great gifts! I do own a Dyson Supersonic Hair Dryer and can say it's worth the splurge. I'm actually proud to say that I didn't reach VIB status (and just barely) until the very end of last year since I was dedicated to working down my stash and cutting down on unnecessary spending/wasting money. I'm now at the point where my stash is manageable and I need to replenish some items so I will be shopping this sale. To maintain focus and stay organized, I put together a wishlist which I've divided into repurchases and new products I'm coveting. I'm not sure how much I'll end up buying but it's a safe bet it'll be less rather than more. I've been using this Laneige Lip Sleeping Mask for years and I've written about why I love it. It's a must for waking up with soft, hydrated lips and I was so happy when I saw that Sephora started carrying it last year. I've raved about Drunk Elephant Babyfacial and I've also written a full review of it. This mask refines my skin and pores, leaving it feeling fresh and smooth like no other. This essence which features a naturally derived peptide formula and it's perfect for the 7 Skin Method. I really like mixing with my Vitamin C Powder because it's so lightweight and the combination has really given my skin a boost of brightness lately. This my current go to mascara and the first clean mascara that I really love. It does a great job with providing length and volume with smudging or flaking. I'm usually more of a drugstore mascara user but this is worth paying more for me. I wrote a full review of this product awhile ago and I still really like it as much as when I first started using it. It is an expensive product but a little goes a long way. It just feels so luxurious and really works to clear skin congestion and improve skin tone. My husband and I both use it and we've seen a difference. I'm kind of picky about my floss and Cocofloss is one of the best flosses I've tried. Infused with coconut oil, this floss is sturdy, stays on my floss holder and really gets in between my teeth, even the hard to reach back areas. This floss comes in some nice flavors too! My favorite is the fresh coconut. I used to have to order it directly from Cocofloss and it's so much more convenient to be able to pick it up at Sephora now. I have reviewed this product here previously and Farmacy New Day Gentle Exfoliating Grains have been a staple in our morning routine since then. It works equally well on my husband's oily skin as it does on my dry skin. We love that the powder form is travel friendly as well. I'm very high on vitamin C lately and this eye cream which contains a brightening combination of eight peptides, five forms of vitamin C, and cucumber extract sounds really appealing to me. Milk Makeup has not only gone 100% vegan, they've also introduced the first ever serum stick. The TSA friendly packaging is cool and the serum itself is supposed to brighten, hydrate and smooth. These innovative drops made with an advanced organic formula provide full spectrum protection from the sun, environmental toxins, and digital overexposure. They're supposed to be super lightweight and can be used alone or blended with your everyday skincare and makeup. Made with "edible" botanical antioxidant ingredients, this serum works to smooth and firm the skin while providing also natural, UV-blocking protection. We should be vigilant about what we put onto our skin since it absorbs 60 percent of the substances that we apply. There shouldn't be a concern with a product that uses food grade ingredients. I'm really intrigued with this mask and not because it's been taking over social media but it's claims to revitalize and hydrate dull, tired skin with vitamins, ceramides, and antioxidants for an instant spa-like radiance. I'm such a fan of fermented ingredients and this lightweight, balancing oil is formulated with a nourishing blend of fermented oils including argan, olive, shiunko, and licorice to deliver essential hydration, polyphenols, and antioxidants benefits to the skin. This organic highlighter is made with nourishing Noni Fruit Extract, Coconut and Rosehip Oils. It also contains crushed Rose Quartz to create a soft pink hue that provides hydration and a luminous glow. If you happen to believe in the healing power of crystals, the rose quartz brings positive energy as well. These individually-wrapped, waterless body wipes that instantly cleanse, refresh, and naturally deodorize would be a practical addition to my home emergency kit which I check and update every few months. Hey you just don't know these days. 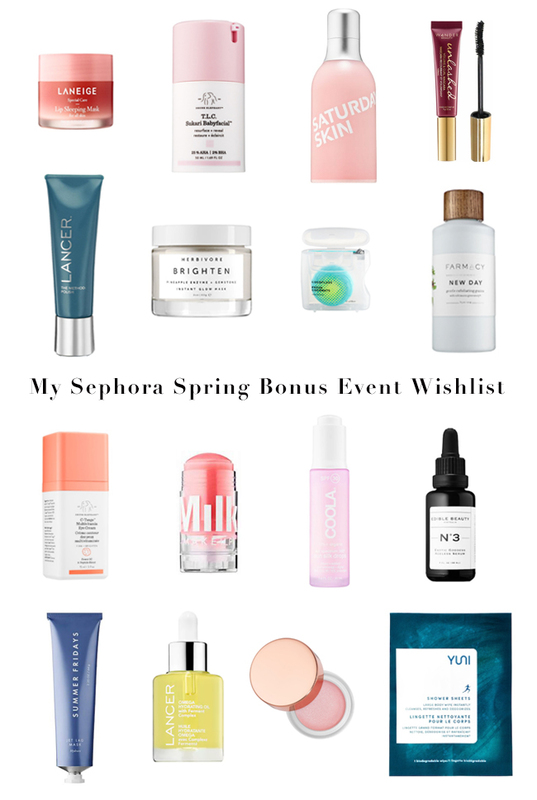 Are you shopping the Sephora Spring Bonus Sale? What will you be getting? I will love to try Saturday Night Freeze I never heard of it until now. I also love the name. I bought the babyfacial but still have to use it! i'm quite excited about it though and hope it works for me too! I've read about the Lineage lip mask too and it looks pretty cool. Oh I've had a few eye creams (It cosmetics) on my list. I need to get another foundation and CC cream. What are a few you've liked lately? Sephora Germany doesn´t have a similar event, so naturally I won´t be shopping it, but I keep a list of favorites to restock through the numerous sales that happen at my trusted online retailers throughout the year. It helps me stay focused and not buy something solely for the purpose of making use of the sale. I really enjoy shopping at Sephora. Looks like I need to make my way over there some time this week or next. That Drunk Elephant eye cream looks nice. This is the first time I'm reading about Milk Makeup Serum Stick, how interesting! I'll check Sephora Canada and see how much it is. Oh wow I had forgotten about this, thanks for the reminder and I will have to check out some of the items on your list here. ohh that's nice! Thanks for letting us know! Yay Sephora’s Spring Bonus Event!!!! Love it. I would love to try the Summer Fridays Jet Lea Mask, I travel a lot and my skin takes a serious beating. I remember your review about Drunken Elephant babyfacial. All of these products seem great. This sale sounds like the perfect time to try them out. I'm not sure if I'll buy anything during this sale, but you have me curious about the Coola SPF now, especially since I spend so much time in front of the computer for work! That Drunk Elephant eye cream is definitely on my list.